Today I started using a new program to track my hiking. It’s called My Runkeeper. I hiked South Mountain Preserve and was really happy with the results. Below is the route map I hiked. 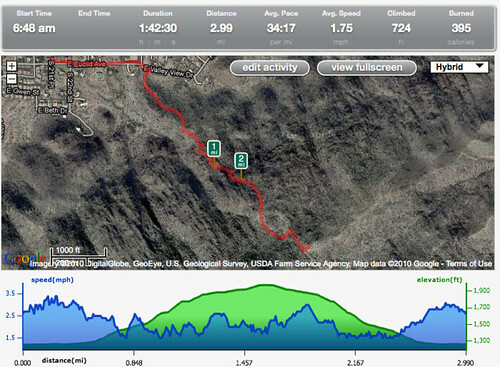 You can also see statistical data on start and end time, how far we hiked, our pace, and how high we climbed (742 feet). But, for me, the best part is the map. The program is free but they do offer a pro version for $9.99. If I am really happy with the results I may upgrade in the fall. For more detail you can go to Runkeeper. Here is there embedded version of above. Log in | 17 queries. 0.211 seconds.